Primus OmniLite Ti and Bottle - A superlight multifuel stove. Building on the popularity of the Omnifuel, this stove uses titanium and smart details to cut down weight. With enough power for winter use, it is a combination of power and light weight. 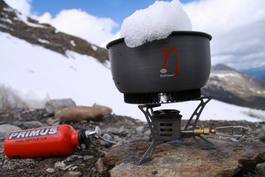 Adjustment enables simmering - not to be taken for granted on a powerful liquid fuel stove! 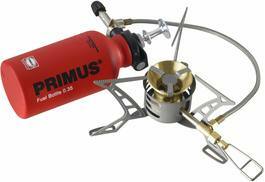 We recommend Primus EtaPower pots with this stove. EtaPower pots make the most of the flame, as their heat catching fins greatly improve efficiency. When using gasoline, avoid vehicle gasoline as they tend to contain engine protecting chemicals which are detrimental to your health. Fuel sold separately. Gas cartridge sold separately. The full set: gas stove, pot and bowl. The choice for long trips: a fuel efficient gas stove for 2 - 5 people. A sturdier, powerful gas stove for larger pots. 4000 Watts, people! 83 grams. The 2019 model of a legendary gas stove. 5 pcs pack of o-rings.